Blog by Richard Williams Jr.
Last night I had the privilege once again of speaking at the Rockbridge Civil War Roundtable in Lexington, Virginia. The meeting was held in the basement of the Marshall Museum on the grounds at VMI. For over 150 years, the VMI buglers have been a crucial part of the Institute. They announce oncoming formations, play Reveille for the beginning of the military day and raising the colors, “Retreat” and “To the Colors” to announce the end of the military duty day and lower the flags, and finally at CQRB and Taps. Their role is of utmost importance to the Institute by keeping cadets informed of formation and class period beginnings and endings. Every cadet is required to report for this and a cannon is fired as a salute just before the flags are lowered. Colonel Gibson said this has been performed every night since the time Jackson taught at VMI. 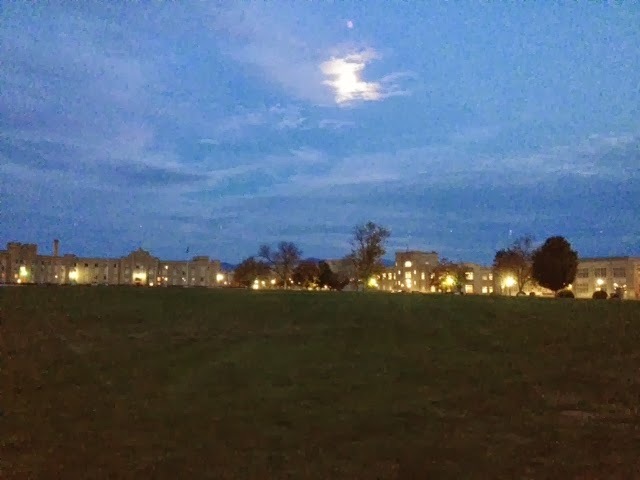 It was one of those surreal moments I will always remember- standing there, the VMI lights and the moon rising over the barracks casting shadows – taking it all in with Colonel Gibson saluting the lowering of the flags. Truly memorable. My topic was: “Dr. Lylburn Downing & Stonewall Jackson: Two of Lexington, Virginia’s Favorite Sons.” I’ll post part of my talk at some point in the future. It was taken from chapter 5 of my book aboutÂ Stonewall Jackson and his black Sunday school class. This entry was posted on Thursday, October 17th, 2013 at 3:03 pm	and is filed under Bugle Stories, History of Taps. You can follow any responses to this entry through the RSS 2.0 feed. You can leave a response, or trackback from your own site.